Coming in March to a liquor store near you (if you’re lucky): Woodford Reserve Double Oaked bourbon, the first permanent new product in the Woodford line in its 15-year history. This ultra-premium bourbon is aged in two unique oak barrels. The first is seasoned outdoors for nine months, then completely toasted and charred on the inside. The second barrel is toasted for more than twice as long as the first and then lightly charred. This heavier toasting intensifies the honey, cream and vanilla notes in the bourbon and gives it a soft, sweet finish. The new product was inspired by the great response to Woodford Reserve’s 2009 limited-edition Master’s Collection Seasoned Oak Finish, brand manager Laura Petry said in a news release. That bourbon was finished in barrels whose wood had been seasoned outdoors for three to five years. 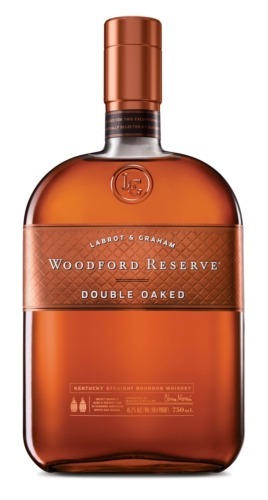 Woodford Reserve Double Oaked is bottled at 90.4 proof and will retail for $49.99 (750 ml).